Back in my teenage years, when make-up and boys were my primary interests, Mom occasionally got me out of school to go fishing. Not a frilly feminine thing to do, but a treasure just the same. One time, the prissy side of me tried to overrun the tomboy side and squirted Windsong perfume all over my fishing scuzzies. Mom and I headed out to our favorite pond, gear in the back and a dozen minnows in a bag full of water on my lap, with me in my stained britches and a t-shirt that reeked. We were enjoying one of the wonderful spring days we loved so much. Everything was green and fresh, and life buzzed all around us. Including the bees. Thing about a flowery perfume is that it attracts bees. Violently. One bumble bee took a liking to my perfume, and with cartoon hearts in his little buggy eyes, chased me all over the pasture where our fishing pond was. Since I couldn’t dodge him, I dove into the car and sat there with the windows up until the amorous little monster gave up. Lousy way to spend a fishing trip. This is one of the little memory treasures Joy DeKok encourages us to write down and store for future generations. In her book, Your Life a Legacy, she discusses how your memories affect those in your life, and not just for the entertainment value. They can help your kids and grandkids understand things about themselves. Joy tells us to give our minds permission to explore our memories. No telling what we’ll find if we allow ourselves the opportunity to dig. For instance, memories that go along with the one above date further back in my childhood, when my brother used to catch bugs and chase me with them. Typical brother-sister stuff, I admit, but from that, I developed a terror of insects. I’ve said for years that I’m afraid of any bug that’s big enough to cast a shadow–and any bug that’s not. If I didn’t have that fear, perhaps my response to the love-sick bumble bee would be to confront him and swat him into the next county. Instead, I ran. My earlier memory explained the later one, and if I pushed my fear of bugs on my kids and grandkids, they’ll develop a fear of them too, without really knowing why. Joy’s book provides some wonderful, practical advice for writing our legacies, and some excellent insights into what will happen when we do explore our memories. We’ll come across events we need to cherish, events we need to confront to allow ourselves to heal, and events we need to ask forgiveness for. We’ll remember both old friends . . . and old enemies. A journey into our minds is best taken with God at our side. In Your Life a Legacy, Joy has opened a new avenue by which to explore ourselves. I heartily recommend her book to anyone who cares enough about their offspring to share their lives with them more fully. 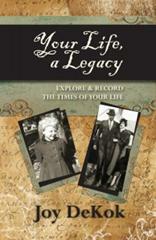 Check out Your Life, a Legacy on Amazon! Thank you, LInda! What wonderful memories of you! It’s always fun stepping back into these old memories, Joy. Thanks to your book, several cropped up in my mind and it was difficult to choose!